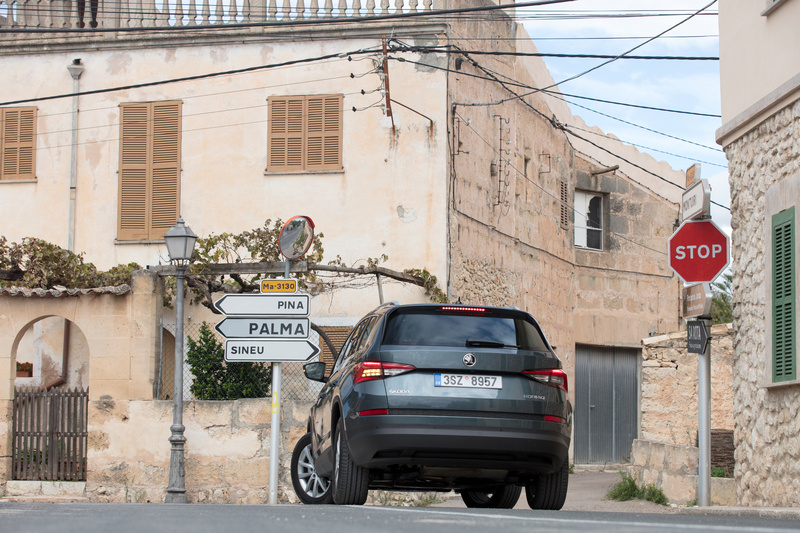 Mladá Boleslav/Palma de Mallorca, November 2016 – With a length of 4.70 m, up to seven seats and the largest boot within its class, the ŠKODA KODIAQ is the Czech car manufacturer’s first large SUV. From early 2017, ŠKODA’s latest model will present itself with all of the brand’s strengths: a design that is full of character, extraordinary interior space, practical intelligence and innovative technology that can otherwise only be found in higher vehicle classes. 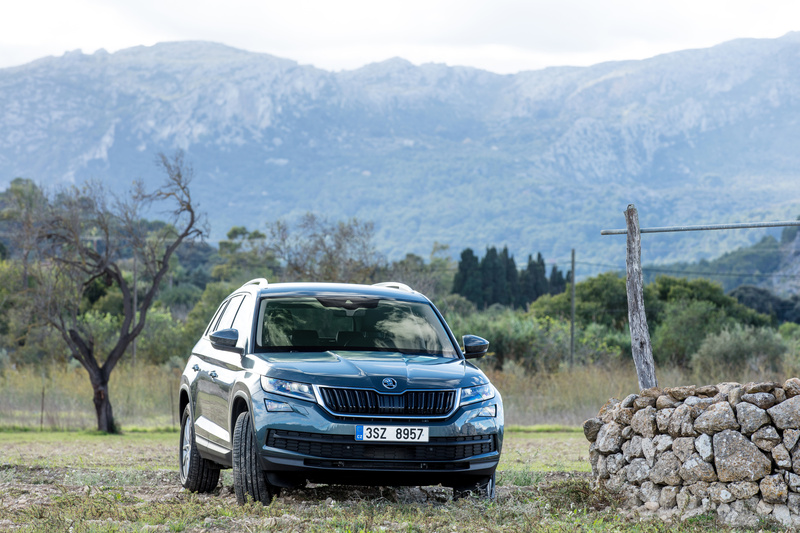 The ŠKODA KODIAQ marks the beginning of ŠKODA’s extensive SUV campaign. 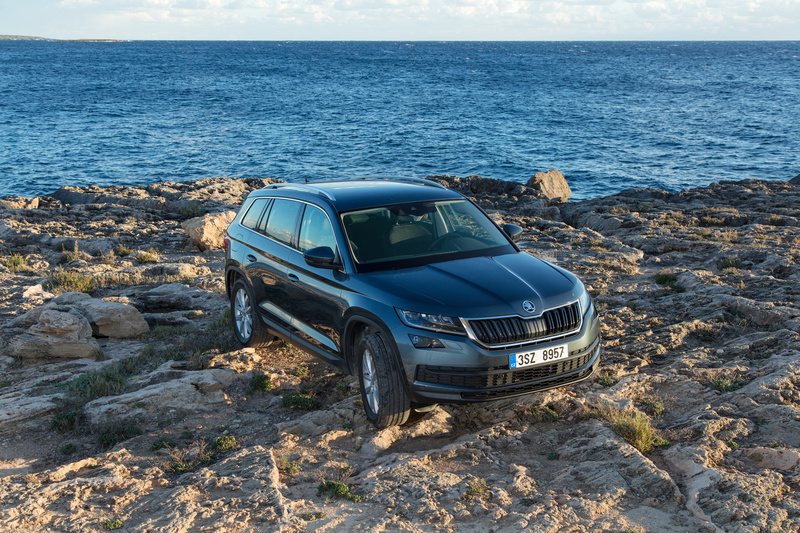 The ŠKODA KODIAQ is an all-rounder: the SUV is suitable for business, as well as family and leisure use – and drives off-road with ease. 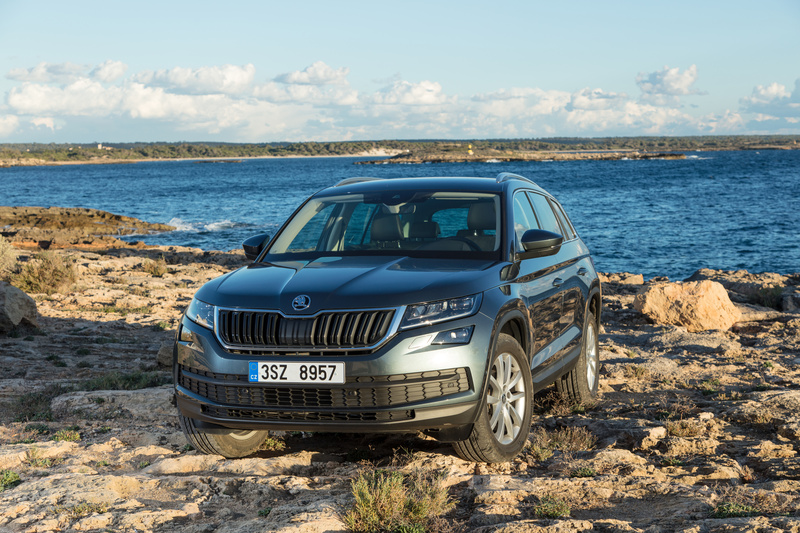 The brand transfers its new design language into the SUV segment with a design that reflects the car’s versatile character: the ŠKODA KODIAQ features a bold interplay of elegant lines, sporty contours and robustness, which make it easily recognisable. 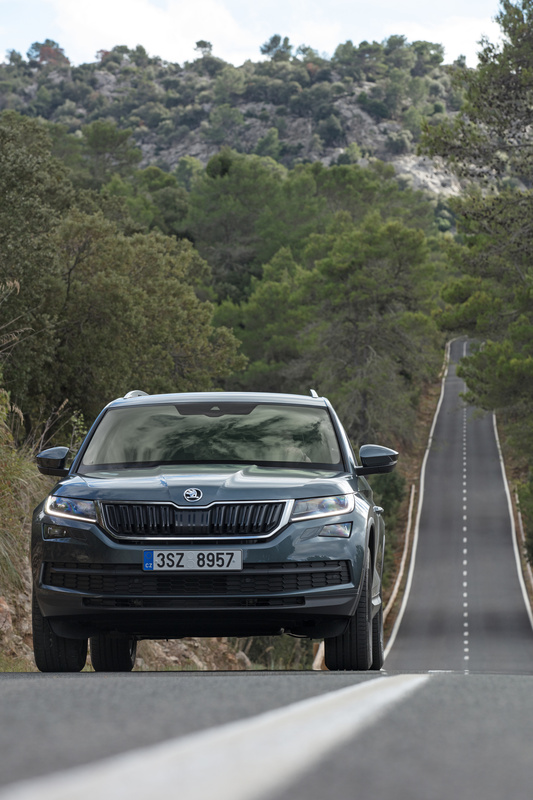 All of the ŠKODA KODIAQ’s lines are clear, precise and clean-cut – this applies in particular to the distinctive, highly recessed shoulder line. Double horizontal lines on the front symbolise protection and strength. The wide, three-dimensional radiator grille is striking and conveys the robust character. The narrow, raked headlights, which flow seamlessly into the radiator grille, give the ŠKODA KODIAQ a distinctive appearance. The two double-headlights create a striking four-eyed face and stand out due to their crystalline structure, which can also be seen in other features such as the rear lights. Here, ŠKODA’s Head of Design, Jozef Kabaň, and his team were inspired by traditional Czech crystal glass art, which is also reflected in the effective interplay of light and shade on the SUV’s highly contoured surfaces. In the side view, the long wheelbase and short overhangs point to the large interior. 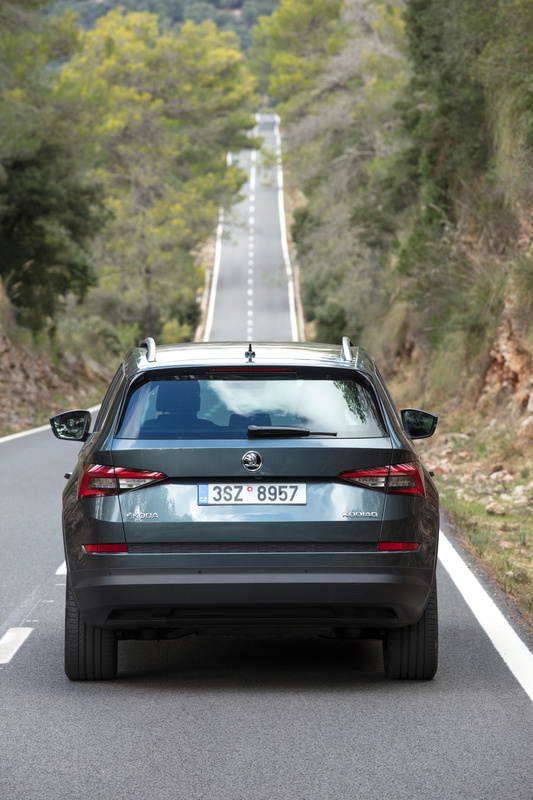 The wheel arches are slightly angular – a key element of ŠKODA’s SUV design language. 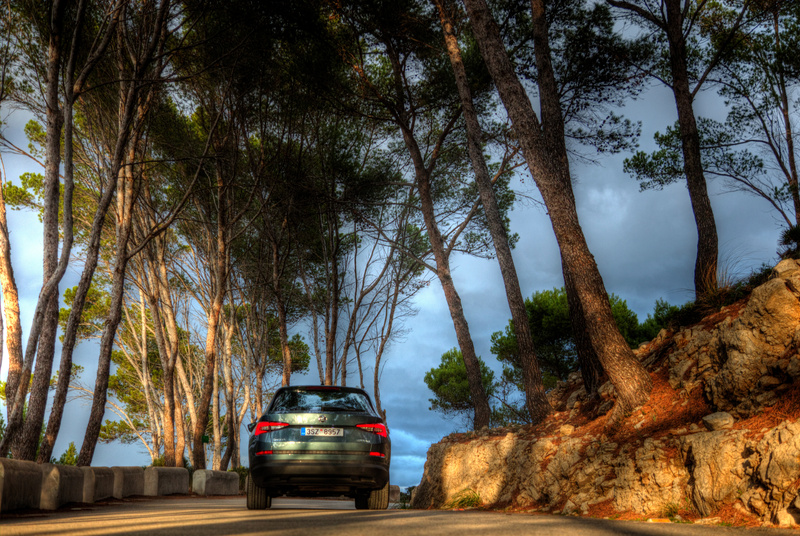 LEDs are used as standard in the tail lights; the rear lights also feature the C-shaped design that is typical of ŠKODA. A choice of 14 paint finishes is available – four standard colours and ten metallic colours. 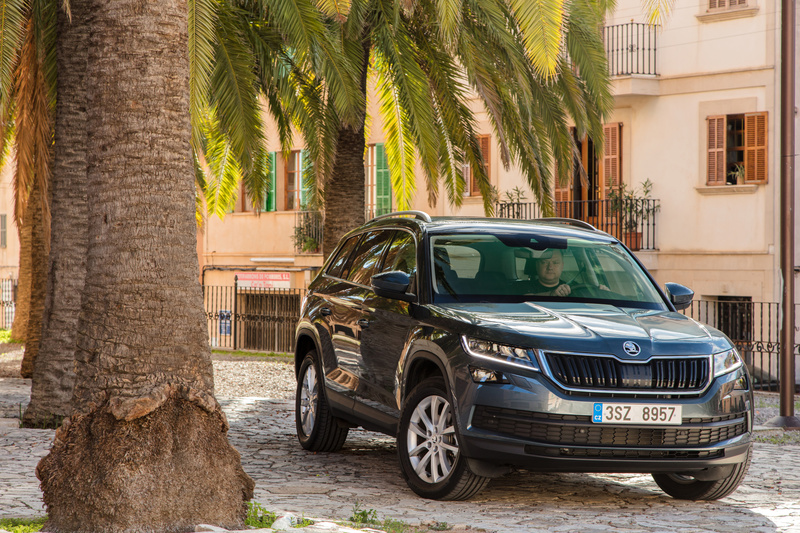 The appearance of the components varies according to the three trim levels – Active, Ambition and Style – which are offered in the ŠKODA KODIAQ as optional extras. ultra-strong backbone. With the entry-level TSI engine and front-wheel drive, the large SUV weighs just 1,427 kg when empty (without driver), or 1,535 kg with the 1.4 TSI engine and all-wheel drive. Torsional stiffness, manufacturing precision, drive comfort and crash safety are also superior. 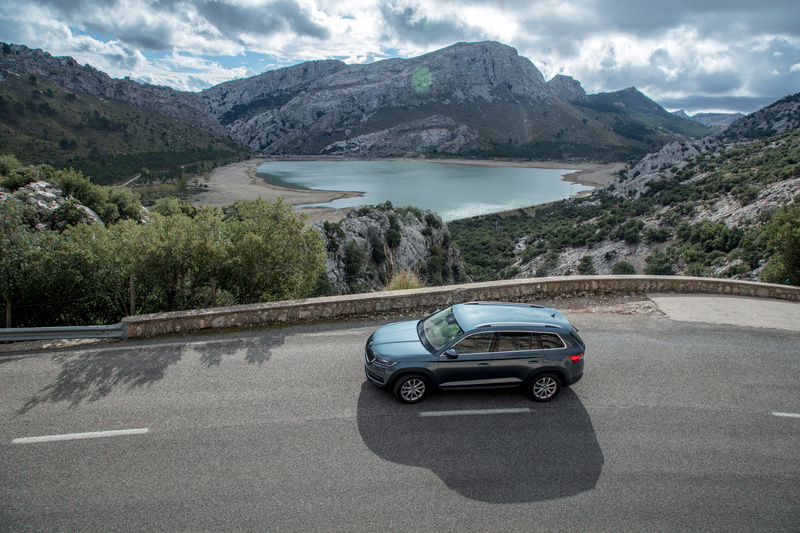 Thanks to its highly aerodynamic finesse, the large SUV achieves a cx value of just 0.33. The amount of space is typical of ŠKODA: the ŠKODA KODIAQ is just 38 mm longer than the ŠKODA OCTAVIA, but offers a larger-than-average interior for the SUV segment. Achieving extraordinary interior space from the exterior dimensions available once again proves the brand’s excellent engineering prowess. The large SUV’s interior length is 1,793 mm; elbow room is 1,527 mm in the front and 1,510 mm in the rear. Head room is 1,020 mm in the front and 1,014 mm in the rear. Rear legroom measures up to 104 mm. The large SUV’s interior is also protective and robust. The crisp exterior design carries on into the interior: the double lines – with their three-dimensional appearance – also feature on the instrument panel. The interior is characterised by bold vertical elements, such as the four large air vents. The large display splits the instrument panel into two equal sections for the driver and passenger. The high-quality workmanship as well as the logical and easy-to-understand operation are typical of ŠKODA. The large circular instruments have a precise and clear design. The steering wheel is available in a choice of different versions – one of which is heated. The optional three-zone Climatronic, which has its own control panel for the rear seats, is another feature which is often only found in higher vehicle classes. The electro-mechanical parking brake is activated by pressing a button. Numerous comfort features are available for the front seats. As an option, they can be heated, ventilated and adjusted electronically; the latter optional extra also includes a memory function. 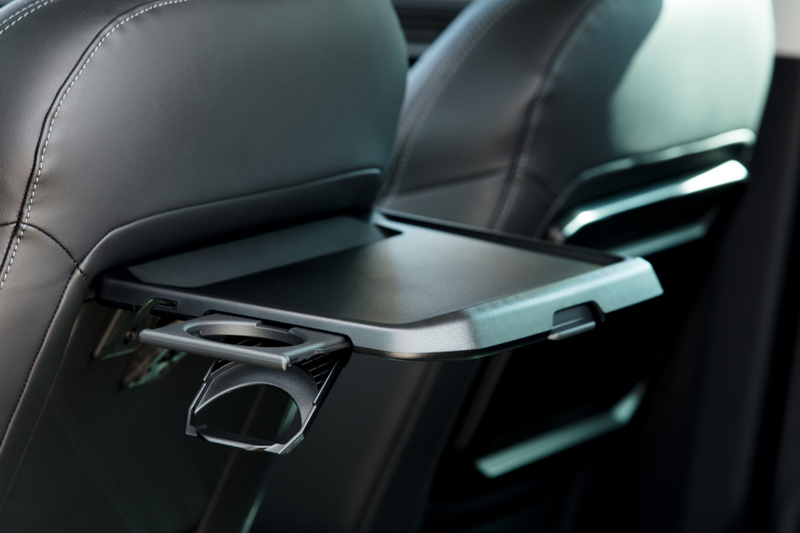 The ŠKODA KODIAQ’s rear seats are also extremely versatile: they can be folded in a ratio of 60:40, can be moved lengthways by 18 cm as standard and the angle of the backrest is individually adjustable. 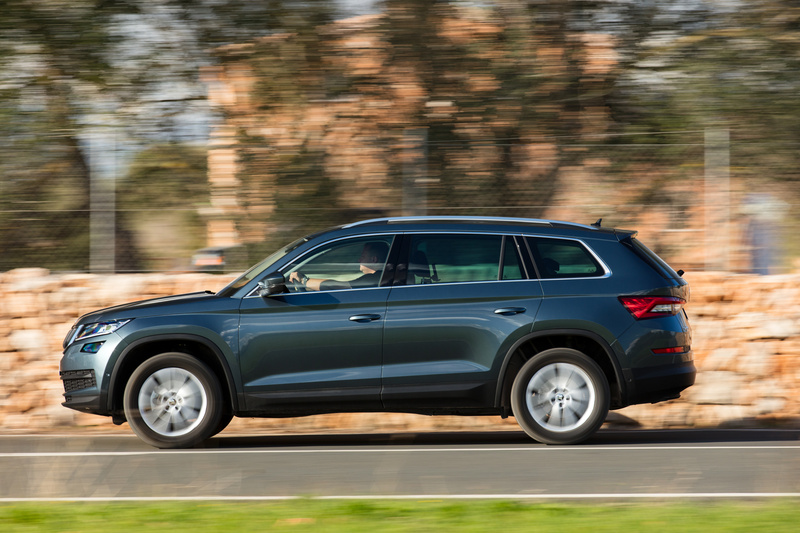 Two more seats in the third row are available as an optional extra – the ŠKODA KODIAQ is the first 7-seater in the brand’s recent history. As an alternative to the standard fabric covers, a fabric/leather combination and leather or Alcantara® covers are offered. The decor is available in five designs. In darkness, the optional ambient lighting adds an individual touch to the interior. It is built into the door trims and can be set to one of ten different colours. 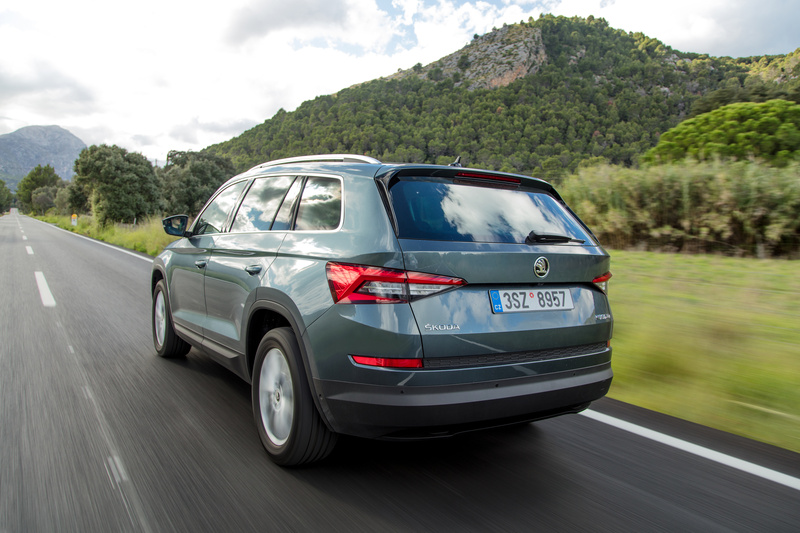 With a volume of 720 to 2,065 l (with the rear seats folded down), the ŠKODA KODIAQ offers the largest boot within its class. If the optional folding passenger seat is chosen, the SUV can transport items up to 2.80 m long. An electrically operated tailgate is available as an option, and can – as an additional optional extra – also be opened and closed using foot gesture command or a button in the interior. 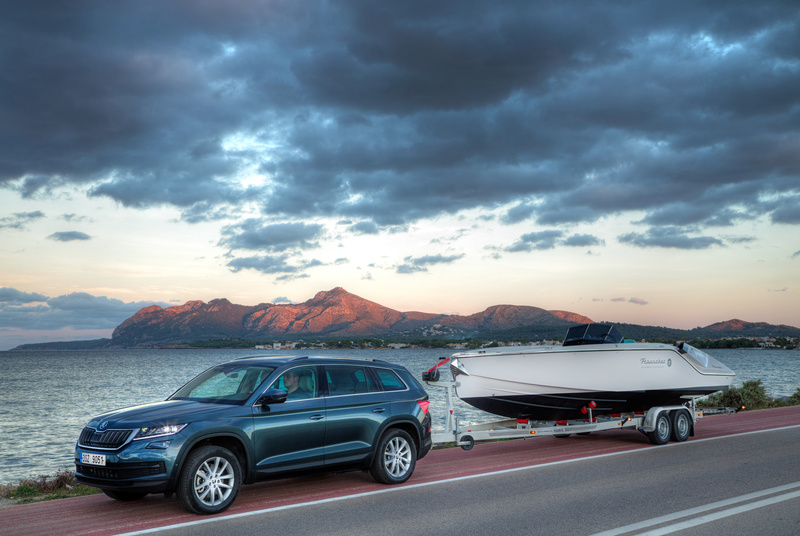 The ŠKODA KODIAQ with the TDI/DSG/4×4 drivetrain can tow a trailer weighing up to 2.5 tonnes. 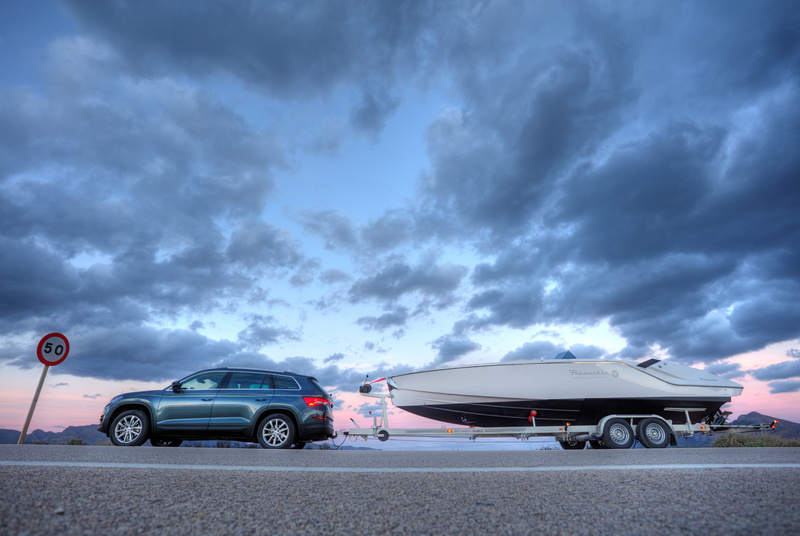 An electrically retractable tow bar is available for this. 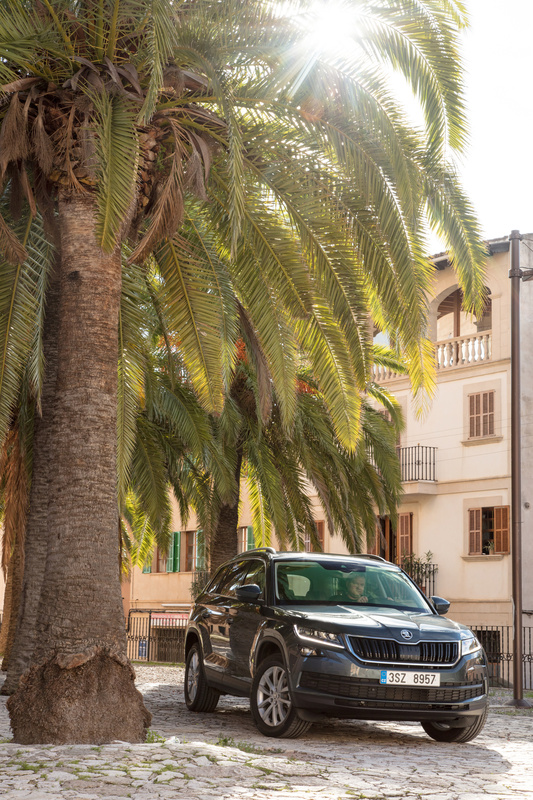 The ‘Simply Clever’ features available in the ŠKODA KODIAQ are further proof that ŠKODA always offers a little bit ‘more car’ for your money – practical and convenient assistance in everyday life which is typical of the brand. 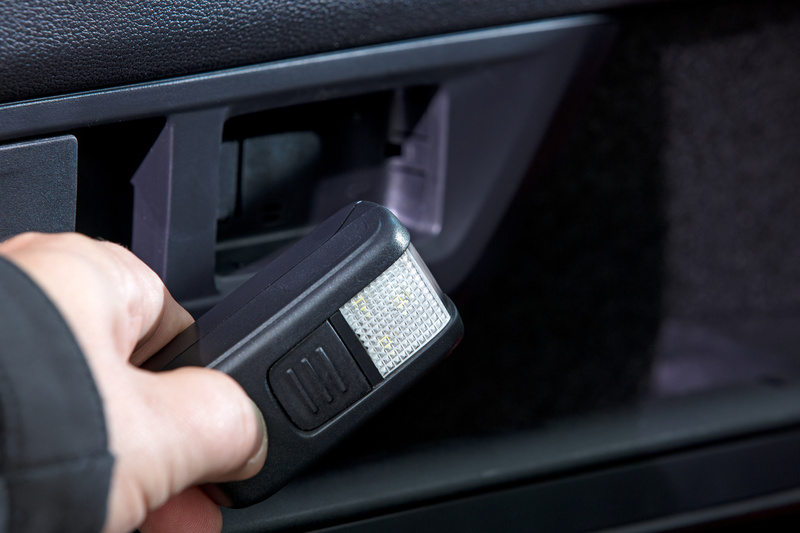 These features include, for example, door-edge protection: thanks to preloaded springs, this deploys automatically when opening the car door and prevents the metal edge of the door from coming into contact with a garage wall or an adjacent car. When shutting the door, the trim folds itself back in. This ‘Simply Clever’ feature thereby prevents bumps and scratches to your own car, as well as to neighbouring vehicles. 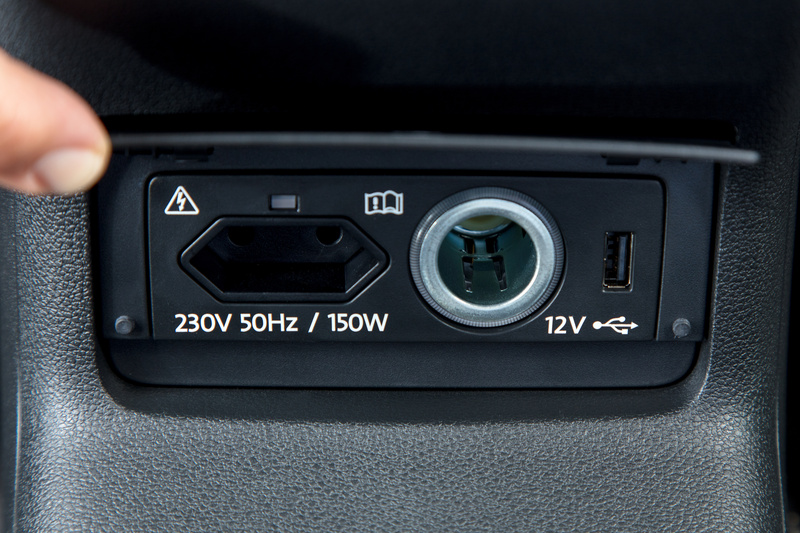 An electric child safety lock for the rear doors, In-Car-Communication, as well as sleep headrests are available as optional extras for the first time in a ŠKODA. 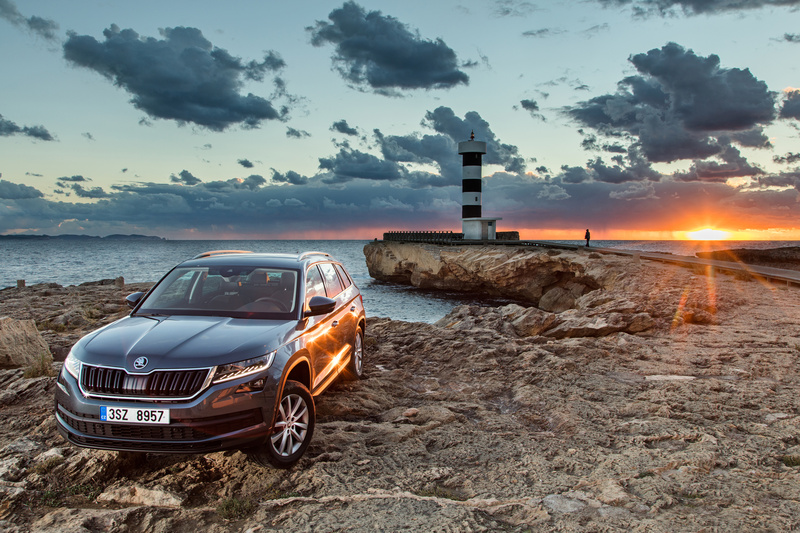 All in all, the ŠKODA KODIAQ provides more than 30 ‘Simply Clever’ features, seven of which are new. 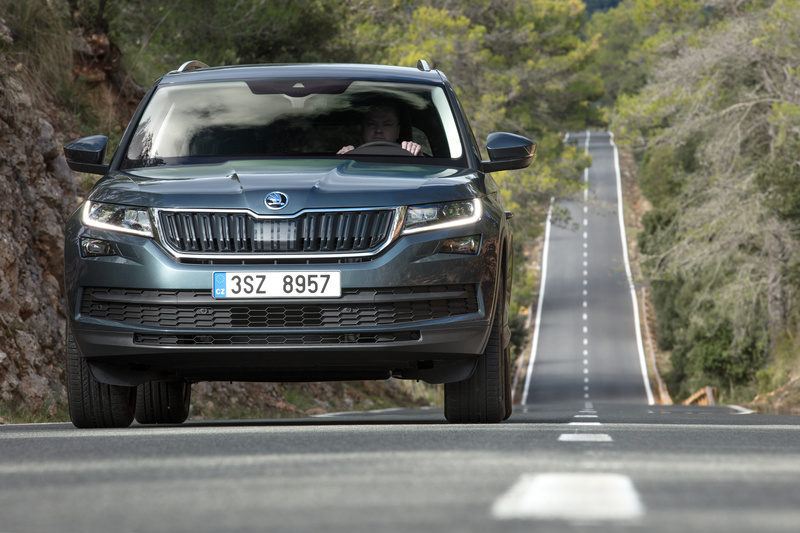 ŠKODA’s large SUV takes to the roads with a wide range of driver assistance systems – many of which have, until now, only been seen in higher vehicle classes. Some systems come as standard, others are available as an option – individually, but also as a package. 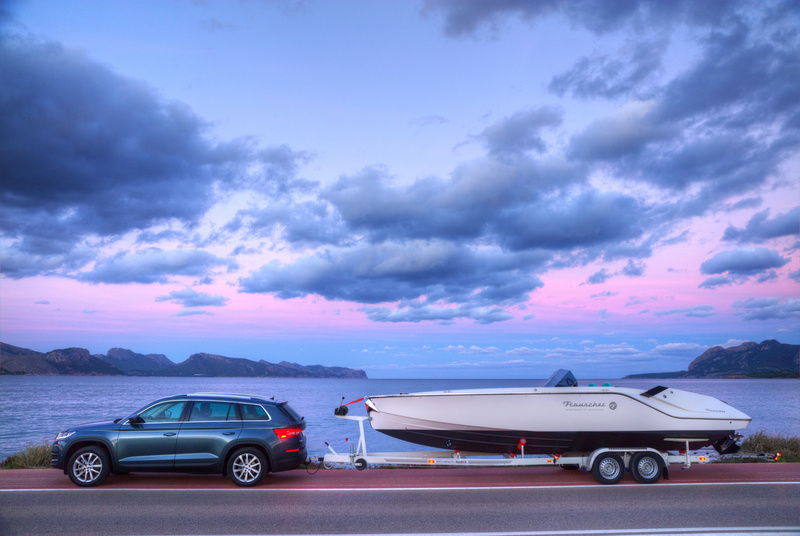 An innovation for the portfolio is Trailer Assist: when the ŠKODA KODIAQ is towing a trailer, the system takes over steering when reversing slowly. Additionally, while reversing, the new Manoeuvre Assist function will brake as soon as an obstacle is detected behind the vehicle. The system is controlled using an enhanced function of the rear parking sensors. The Area View system is also a first for the brand: the surround-view cameras, which are located in the front and rear sections as well as in the wing mirrors of the ŠKODA KODIAQ, come with wide-angle lenses and allow views of the area immediately surrounding the car to be displayed on the monitor. These include a virtual, top-down view and 180-degree images of the areas to the front and rear. This makes it easier to drive in confusing situations or on rough terrain. Front Assist including City Emergency Brake comes as standard and, using radar, can detect dangerous situations involving pedestrians or other vehicles in front of the car. If necessary, the system warns the driver and, when required, partially or fully applies the brakes. City Emergency Brake is active up to 34 km/h. Predictive Pedestrian Protection complements Front Assist. 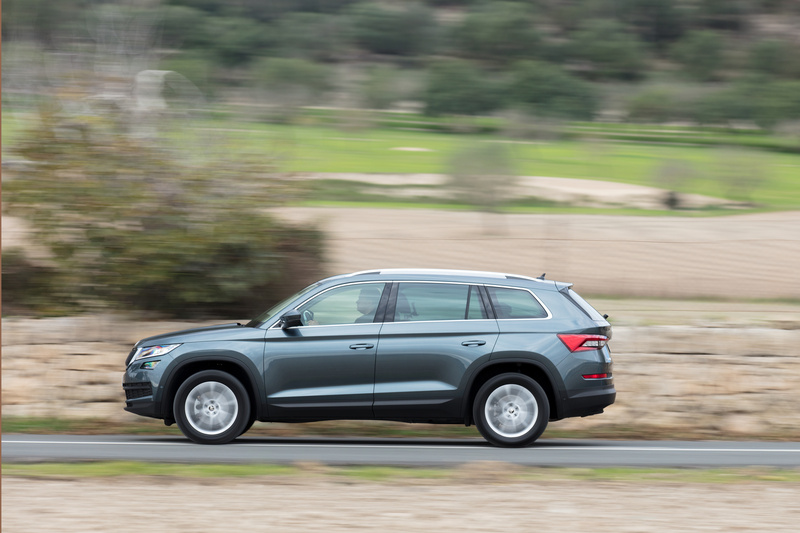 Adaptive Cruise Control (ACC) is also radar assisted and helps the driver to maintain the selected speed and the desired gap between the ŠKODA KODIAQ and the vehicle in front. Lane Assist, Blind Spot Detect and Rear Traffic Alert help the driver to stay in lane, make changing lanes safer using the rear radar and help when manoeuvring in reverse. If the car is fitted with Lane Assist, ACC and DSG transmission, Traffic Jam Assist comes as an additional function. It maintains speed and applies the brakes in slow-moving traffic. Additionally, the car will be kept in lane up to speeds of 60 km/h thanks to the Lane Assist function. Driver Alert detects signs of fatigue in the driver and prompts the driver to take a break. Emergency Assist, also only in combination with DSG transmission, is a further function of the ACC and Lane Assist combination. Should a situation arise where the driver becomes unable to drive the vehicle, the system can bring the large SUV to a standstill. Crew Protect Assist, available in a choice of two variants, closes the windows and sunroof, and tensions the seat belts automatically in the event of an impending accident. If you have an accident, the Multi-Collision Brake, which comes as standard, prevents any further uncontrolled movement of the ŠKODA KODIAQ. The camera-based Travel Assist with Traffic Sign Recognition displays speed limits and other road signs as images on the in-car computer as well as the navigation system. 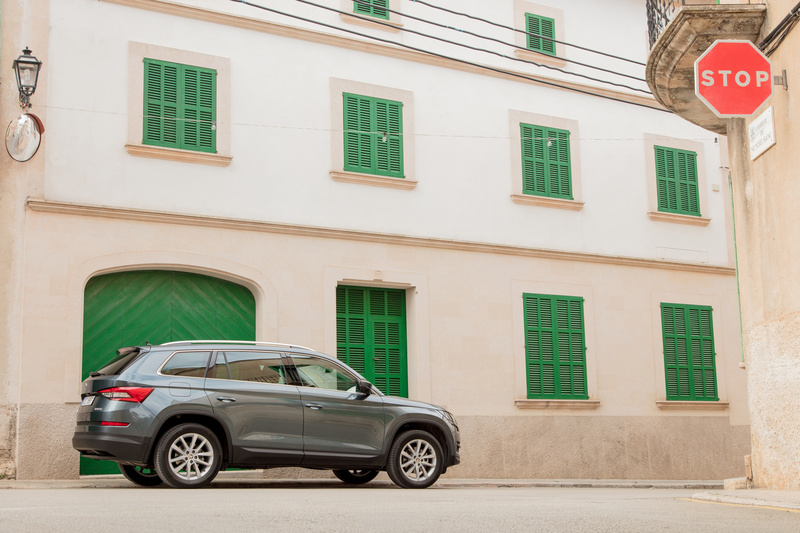 With its infotainment and connectivity solutions, the large SUV from ŠKODA shows how an SUV can always be online. With the new, groundbreaking and innovative mobile online services, ŠKODA presents a new dimension of navigation, information and entertainment. 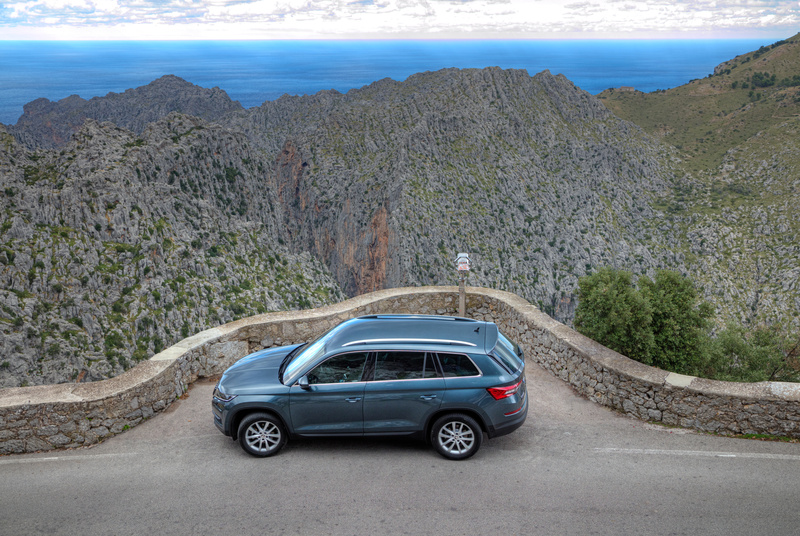 At the same time, ŠKODA Connect helps with remote access to the vehicle as well as assistance. ŠKODA Connect is comprised of two categories: the Infotainment Online services provide more information and real-time navigation details. Care Connect provides remote access as well as assistance. Infotainment Online includes Online Traffic Information, which shows traffic flow on the chosen route in real time. The Google Earth™ services (available for the Columbus system) embed the route into a topographical view from Google; Google Street View™ (available for the Columbus system) displays a street view of the destination. Map updates as well as the Petrol Stations, Parking Spaces, News, Weather and My Points of Interest services round off the infotainment package. Infotainment Online services are provided free of charge for the first year after purchasing a new car fitted with a navigation system and are available at an extra cost thereafter. The Emergency Call after an accident is the most important feature of the Care Connect services: the Emergency Call is sent directly to an emergency call centre when a restraint system is deployed. This comes as standard for the Ambition and Style trim levels and is integrated into the Care Connect services. It also comes with a notification function for minor accidents as well as a Breakdown Call. Proactive Service is also included in the Care Connect services. When this is activated, all of the required data is sent to the garage in a timely manner before a vehicle’s service. The third Care Connect service is Remote Access. 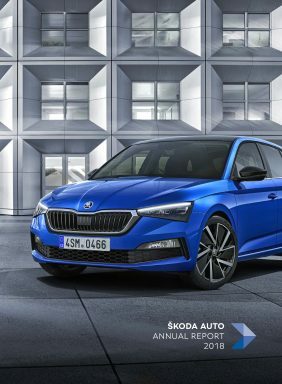 ŠKODA now also offers the ŠKODA Connect app, which can be used to access and control additional services. For example: the smartphone will alert the owner if their car is being moved by a third party in an unauthorised manner – be that too fast or outside a specified area. Using the app, the route planner can be transferred from home to the navigation system in the car. Complementing the ŠKODA Connect app, the ŠKODA Connect Portal, which brings the ŠKODA Connect services to the customer’s home computer, is also available. 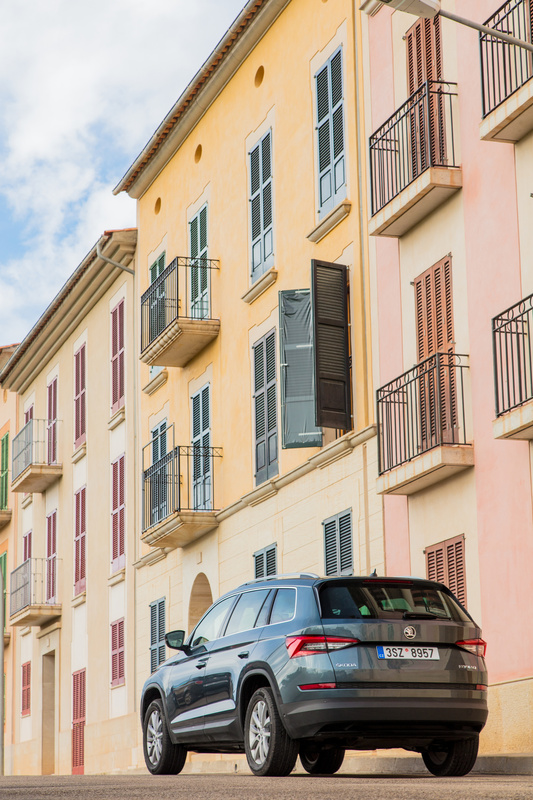 The Care Connect services are available free of charge for the first year after purchasing a new car. Thereafter, Remote Access services are subject to a fee, while all other Care Connect services (Proactive Service and Emergency Call) can be used free of charge for another 13 years. 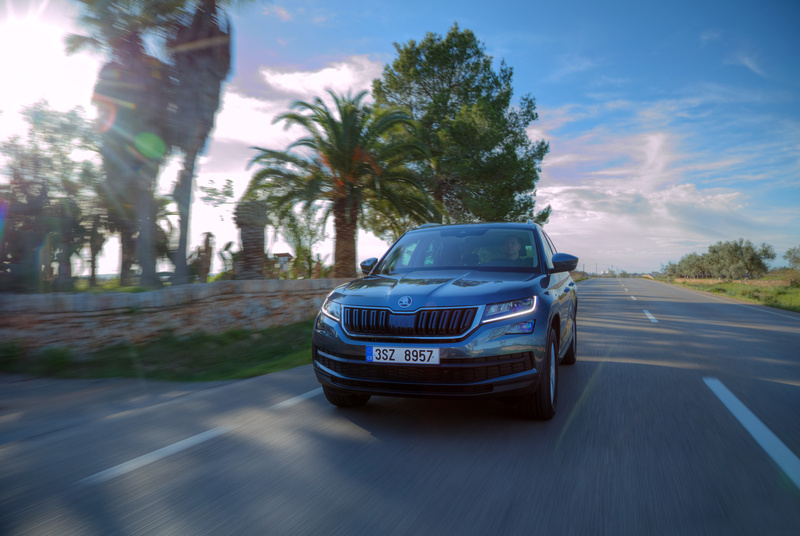 For the first time, the SmartLink+ app also integrates SmartGate in the new ŠKODA KODIAQ SUV – alongside the existing Apple CarPlay, Android Auto and MirrorLink™ standards. All of the popular services are available in just one app: navigational data, music and news, as well as all of the relevant vehicle data via the car’s infotainment system – and this is the case for every trim level. The music and infotainment systems in the ŠKODA KODIAQ represent the latest technology. They work quickly, offer state-of-the-art functions and interfaces, and feature capacitive touch displays in a glass design – they react to the touch of a finger and not just to pressure. The basic functions are easy to operate using physical buttons and control dials. The Swing infotainment system with its 6.5-inch screen comes as standard. It can be supplemented with a smartphone Bluetooth connection and ŠKODA SmartLink+. SmartLink+ supports the use of the Apple CarPlay, Android Auto and MirrorLink™ standards in the car. When the customer connects their phone to the USB port, the relevant setting shows on the infotainment display. The optional Bolero infotainment system features a high-definition 8.0-inch touchscreen, including the In-Car-Communication (ICC) function. The hands-free microphone records the driver’s voice, and transfers it to the back seats via the rear speakers. The Amundsen navigation infotainment system builds on the capabilities of the Bolero system with a navigation function as well as a special display mode for driving off-road or even in narrow car parks. The top-of-the-range infotainment system, the Columbus navigation system, adds a 64-GB flash memory and DVD drive. 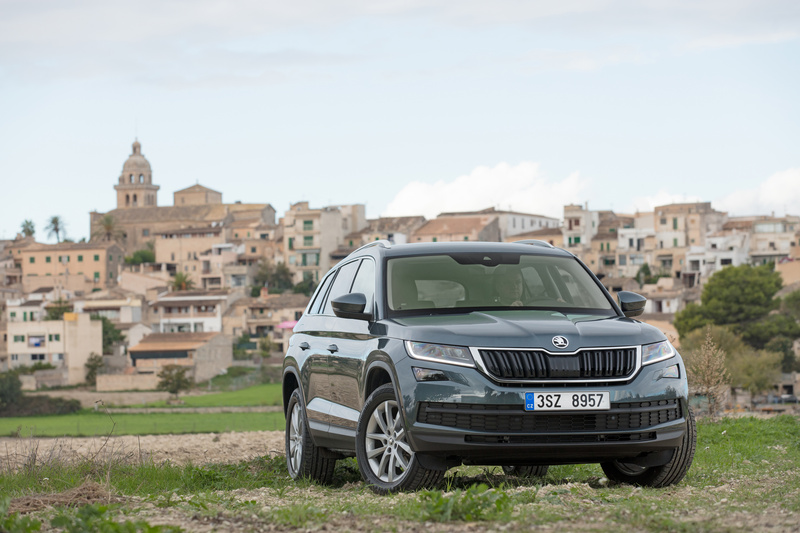 An optional LTE module facilitates high-speed online access in the ŠKODA KODIAQ. Using a Wi-Fi hotspot (optional), passengers can use their mobile devices to surf, stream and send emails at their convenience. 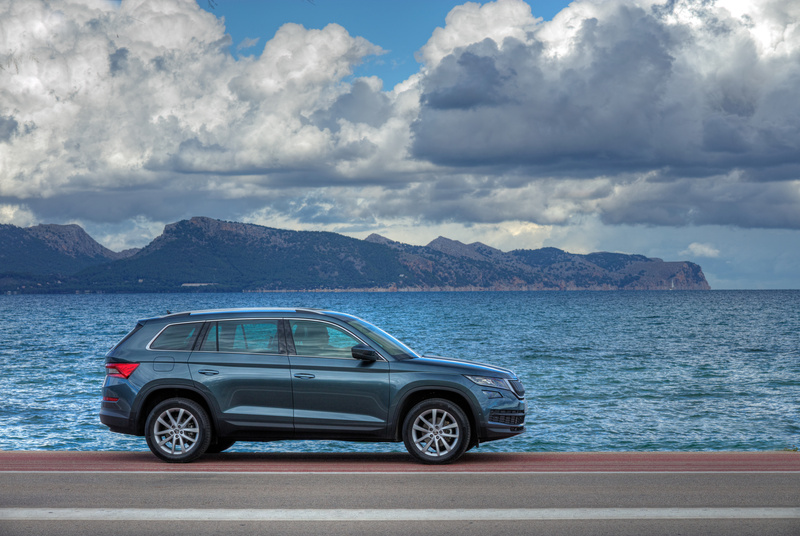 Attractive additional components round off the hardware offering in the ŠKODA KODIAQ: the Phonebox charges a smartphone inductively using the Qi standard and connects to the car aerial – both processes occur wirelessly. The Canton Sound System features ten speakers, including a subwoofer, and has a power output of 575 W. As an option, the ŠKODA KODIAQ can be equipped with tablet holders that can be attached to the front headrests. The devices can be charged using optional 230-V and USB sockets. 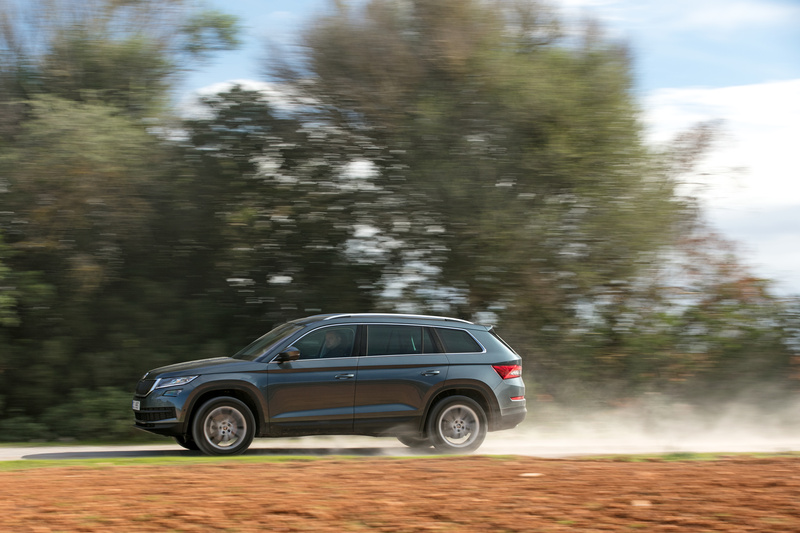 Five powertrains, two TDI and three TSI engines, make up the engine range at the launch of the ŠKODA KODIAQ. They have capacities of 1.4 and 2.0 l, and power output ranges from 92 kW (125 PS) to 140 kW (190 PS). The diesel and petrol engines feature turbocharged direct injection and fulfil EU6 emission standards. All engines also feature a Stop-Start system, brake energy recovery and a powerful thermo-management system, contributing to low consumption despite the mighty power delivery. The 2.0 TDI is available in two versions. The first version generates 110 kW (150 PS) and 340 Nm. The top-of-the-range version delivers 140 kW (190 PS) and puts 400 Nm on the crankshaft. On average, when fitted with a front-wheel-drive manual gearbox, the entry-level TDI consumes 4.9 l of diesel (129 g CO2/km) per 100 km. The most powerful diesel engine accelerates the large SUV from 0-100 km/h in 8.9 s and reaches a top speed of up to 210 km/h. The range of petrol engines consists of two 1.4 TSI engines and one 2.0 TSI. The entry-level version of the compact four-cylinder generates 92 kW (125 PS) and 200 Nm of torque. Its NEDC consumption is 6.0 l per 100 km, which corresponds to 137 g CO2/km. In the more powerful version, the 1.4-litre exerts 110 kW (150 PS) and 250 Nm of torque; its ACT system – Active Cylinder Technology – shuts down the second and third cylinders when the load and engine speed are low. The top-of-the-range 2.0 TSI petrol engine features a new combustion process for high efficiency. Power output is 132 kW (180 PS), torque is 320 Nm. The ŠKODA KODIAQ is available with various different transmissions. Depending on the engine, there is a 6-speed manual gearbox or DSG transmissions with six or seven speeds. The new 7-speed dual-clutch transmission is making its debut at ŠKODA. It is a variant that has been designed for powerful engines with torque of up to 600 Nm. The DSG transmission is a very compact construction and enables quick and comfortable gear changing. The driver can operate the 7-speed DSG in the automatic D and S mode, or control it manually using the gear lever or the steering wheel paddles. 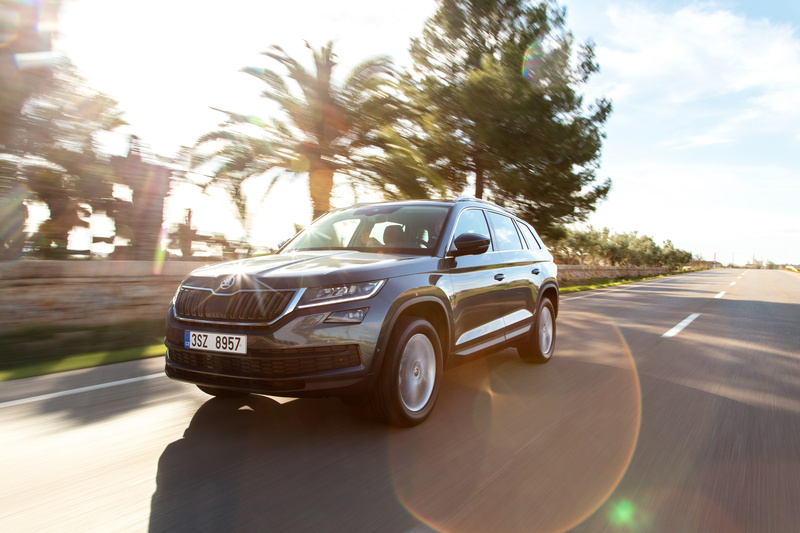 When Eco mode is selected in the optional Driving Mode Select, the car is taken out of gear: as soon as the driver takes their foot off the accelerator at a speed above 20 km/h, drive is disengaged – the ŠKODA KODIAQ is coasting. 6-speed transmission and front-wheel drive. The all-wheel-drive system with electronic control is available for most engine variants. It delivers a big increase in traction, stability and driving safety – even off-road. The centrepiece of the all-wheel drive is an electronically controlled multi-plate clutch. The all-wheel-drive system works intelligently and quickly. The control unit constantly calculates the ideal driving torque for the rear axle; loss of traction is virtually eliminated due to a control system that is dependent on driving status. When in overrun or at low load, drive is provided via the front axle, which saves fuel. The chassis of the ŠKODA KODIAQ is also the result of concentrated expertise. The components of the MacPherson front struts consist partially of aluminium; the steel four-link rear axle absorbs the longitudinal and transverse forces separately. 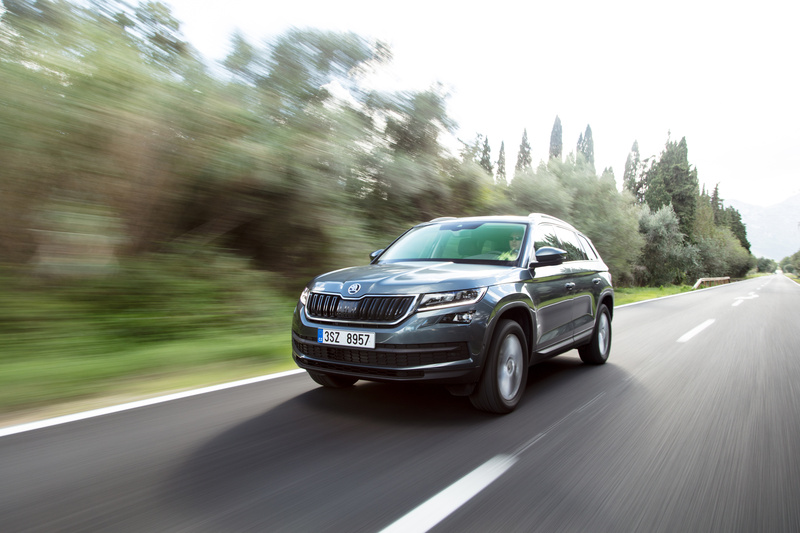 The power steering, using an efficient electro-mechanical drive, ensures exact contact with the road and works in close harmony with several assistance systems in the ŠKODA KODIAQ. 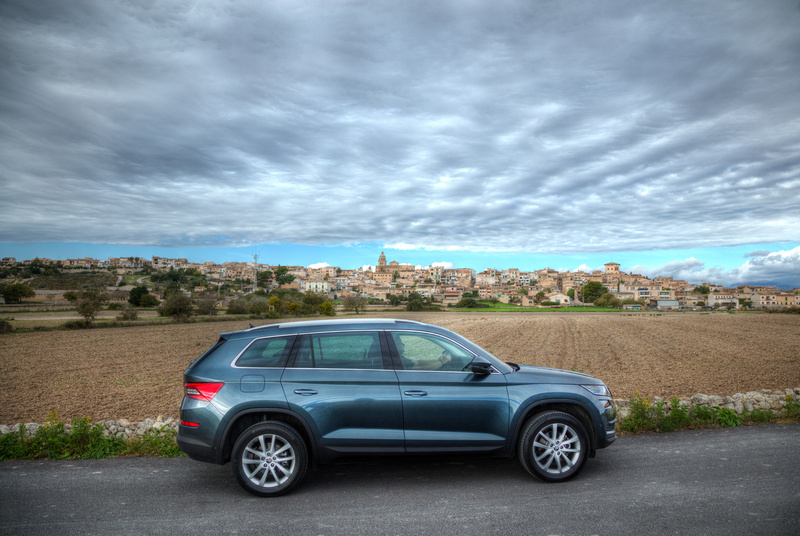 In the Active and Ambition trim levels, the large SUV from ŠKODA comes equipped with 17-inch wheels as standard; 18-inch wheels are standard in the Style trim level. 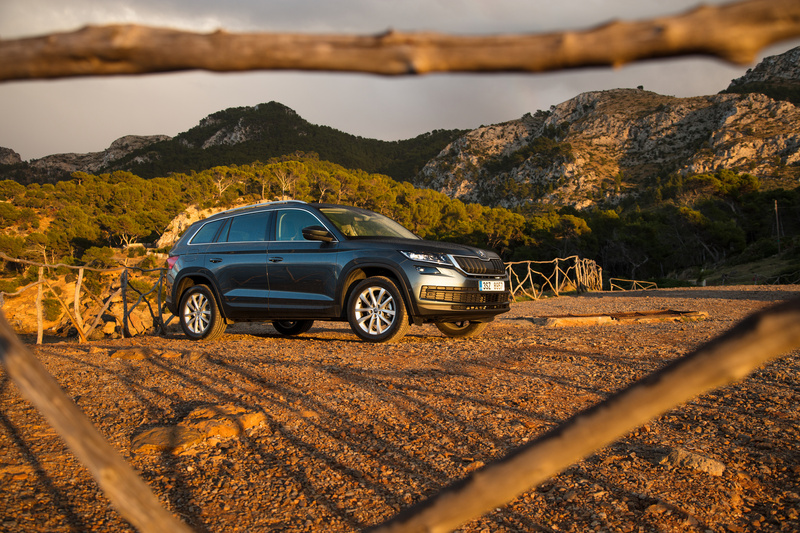 The range of optional extras extends to burnished 19-inch wheels. The brakes – with large ventilated brake discs at the front – are strong and stable. When cornering quickly, the electronic differential lock XDS+, which is a function of the Electronic Stability Control (ESC), makes handling even smoother and safer for both front- and all-wheel drive. 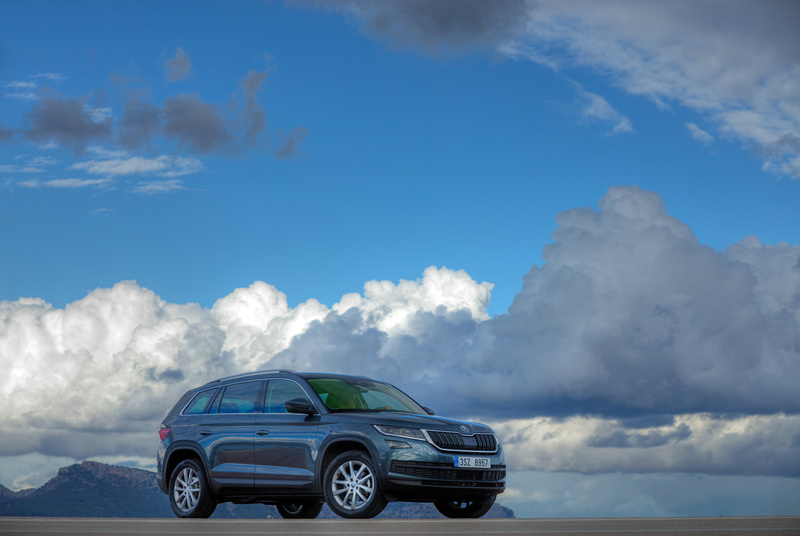 As an optional extra, ŠKODA is making Driving Mode Select available in its large SUV. It allows the driver to adjust the operation of the engine and DSG management, power steering, air conditioning and other systems in Normal, Eco, Sport and Individual modes. The all-wheel-drive versions offer Snow mode on top of this, which is designed for driving on roads and does not have a speed limit. Snow mode adapts the operation of the ABS, ASR and ACC (if fitted) systems, as well as the engine management to slippery and snow-covered roads. Adaptive Dynamic Chassis Control (DCC) is also available as an option, and is integrated into Driving Mode Select. Here, electric valves control the work of the shock absorbers depending on the situation. Combined with Driving Mode Select, the system adapts to the driving style of the driver and manoeuvres the driver safely on the road. Using DCC, the driver can choose between Comfort, Normal or Sport modes. 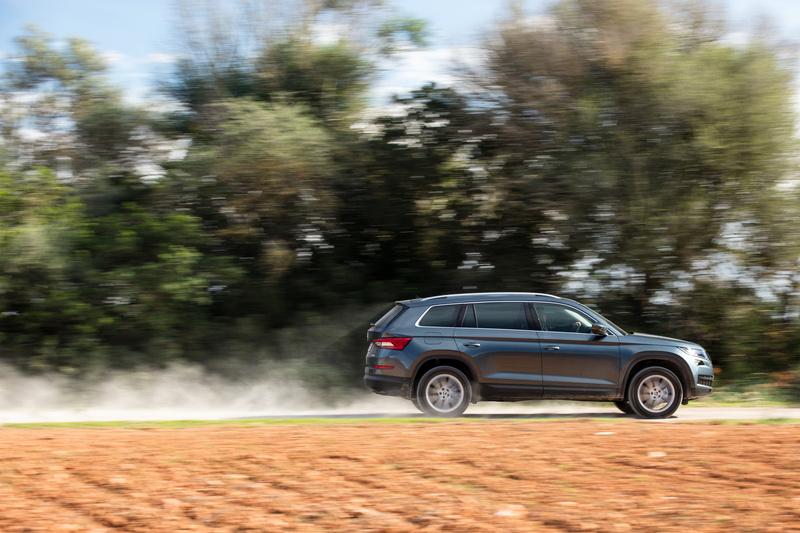 And the ŠKODA KODIAQ keeps going when the paved road ends. Off-road mode can be selected by the simple touch of a button (optional for the all-wheel-drive versions in combination with Driving Mode Select). Here, the chassis, engine management and brakes adjust their operation specifically to rough terrain. This mainly involves pulling away, traction and deceleration. In off-road mode, Hill Descent Assist helps the driver to safely master driving downhill over rough terrain by braking appropriately.